The 501st Legion's Shoot-A-Trooper now has a nice trailer to help promote the Celebration VI charity event. Thanks to Daniel for writing in to spread the word. The world-wide costuming organization known as the 501st Legion will be hosting it?s highly successful charity event ?Shoot ?A-Trooper? at Celebration VI, August 23-26 in Orlando Florida. 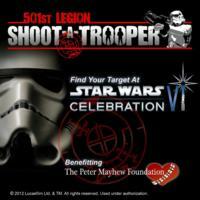 501st Legion members from all over the world will be dodging darts to raise money to benefit the Peter Mayhew Foundation. "Shoot-A-Trooper" includes a replica set of the blast doors from the Death Star, which serves as a backdrop, where Star Wars fans young and old will have the opportunity to shoot NERF darts at 501st members dressed as Stormtroopers and other characters from the Star Wars universe, all for a charity donation. Fans may also pose for photographs with the troopers. Actor Peter Mayhew (Chewbacca) will make a daily appearance throughout the four day event for photo opportunities. The Peter Mayhew Foundation- Founded by actor Peter Mayhew and his wife Angie, this non-profit group organizes charity work that supports Children's Hospitals, Wounded Warrior Centers, and children with special needs. The foundation also works to support Make A Wish families, and more recently Peter makes personal appearances in his own community for ?After School Book Readings? for at risk kids. Mayhew played the acting role of ?Chewbacca? in the Star Wars trilogies and Star Wars Episode III; Revenge of the Sith. www.petermayhewfoundation.org.